Film Photography Lust: An Impulse Buy...Yuck, Yuck...Get It? Look what I found at Goodwill yesterday. Its my latest film camera find. 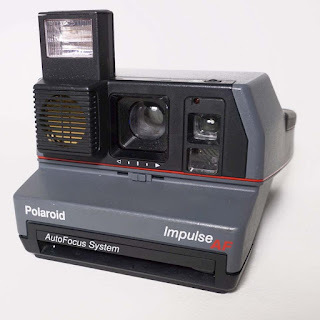 An instant camera at that! This one is a Polaroid Impulse AF. That's right it's Impulse AS F*CK. What?? oh sorry, "Auto Focus". I didn't have this version until yesterday. The other Impulse cameras I have don't have the auto focus. The camera looks clean, the rollers are good, a fresh but empty pack of film (with a good battery) leads me to believe it will be A-OK. Now time to run down to my local camera store and get a few packs of Impossible Project Film. There are a couple of features that make this camera the potential to be one of my go too instant cameras. That is of course, if it works. First there is a standard tripod mount. Also, a self timer button. Right on, Polaroid selfies!! Also if the AF works then it will minimize out of focus photos. When you are paying $25/pack for 8 shots, you don't want out of focus images. I'll give this guy a go during my next model shoot. More to come.